SpectraFlair | VIAVI Solutions Inc.
SpectraFlair pigment is a multi-layer thin-film flake comprised of magnesium fluoride and aluminum. Precisely controlling the thickness and relief of the pigment’s flake structure produces the diffractive effect characteristic of SpectraFlair pigment. To maintain the diffractive effect, the layer thickness and three-dimensional relief of the pigment must be controlled to very precise tolerances. 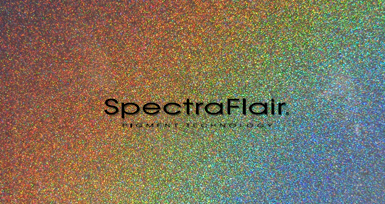 SpectraFlair pigments are light diffractive colorants that generate the appearance of multiple, bright rainbow producing prisms moving over a liquid silver color. The combination of rainbow-like color, aluminum core, and high pigment flake diameter to thickness ratio of SpectraFlair pigments create the appealing, iridescent, liquid silver metallic appearance. The pigments change from a typical metallic appearance in low illumination, to vivid, multi-rainbow effects in direct bright light. SpectraFlair pigment is a neutral color that may be used as the sole colorant or combined with other pigments and dyes to create subtle, sophisticated dimensions for products and spaces. Fine grade pigment (D50 average of 14 microns) - creates a diffractive rainbow effect that appears to emanate from the surface in pleasing and subtle tones but with noticeably smoother, softer and more satin-like effects. Standard grade pigment (D50 average of 20 microns) - optimally balances the diffractive rainbow effect with a high level of specular reflection. Coarse grade pigment (D50 average of 35 microns) - produces a silver-based color with a diffractive rainbow effect that is more distinct and chromatic with a noticeably coarser and more sparkling appearance. ChromaFlair pigments are unique, multi-layer pigment flakes that give paints, coatings, plastics, textiles and packaging the ability to change color when viewed from different angles.